(James J. Lee/Staff) Marines ride in an open-back Humvee in Kajaki, Afghanistan. FORWARD OPERATING BASE SHAMSHER, Afghanistan — Good morning, friends. I’m back at the computer now after a foot patrol in Sangin’s Green Zone this morning with Baker Company, 1st Battalion, 7th Marines. We pushed through fields, canals and trails for several hours, and it was relatively uneventful. One thing I would like to point out today: Marine Corps Times has posted online another of my long-form features out of Kajaki district. It highlights the increasing prominence of surveillance and raids for Marines in Afghanistan, particularly in light of the planned drawdown of forces there. Conducting raids successfully requires massive amounts of planning and understanding, however. 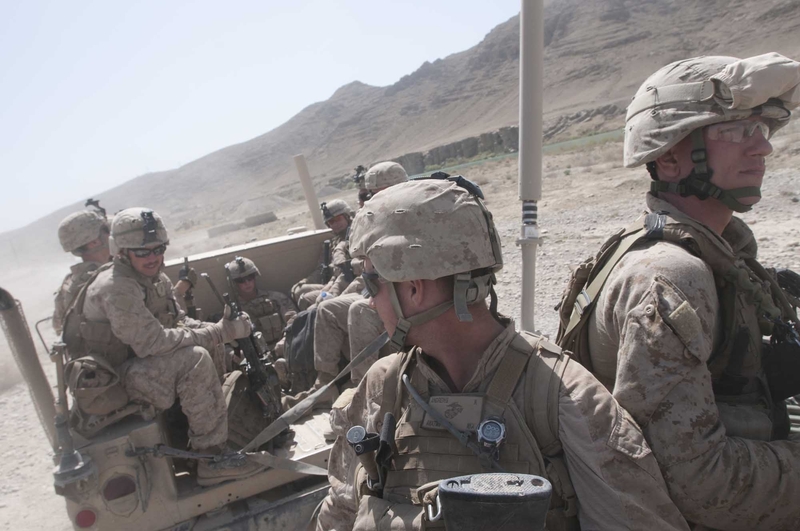 Marines must know where Taliban fighters and their weapons caches are, and the best way to strike. The raids and surveillance have been particularly helpful in the Zamindawar area of Kajaki, Marines said. The region is a known insurgent staging ground where coalition forces have confiscated mass quantities of drugs, weapons and materials used to make improvised explosive devices. Watching Hutchenson and other Marines observe Zamindawar from Observation Post Shrine made for a fascinating evening.